Gallia Academy senior Cory Call (22) releases a shot attempt during the second half of a Division II sectional basketball game against River Valley at Southeastern High School in Londonderry, Ohio. A total of 12 players from the Ohio Valley Publishing area were chosen to the 2019 Ohio High School Basketball Coaches Association District 13 boys basketball teams, as voted on by the coaches within Gallia, Meigs, Jackson, Athens, Perry, Hocking, Washington and Lawrence counties. Each of the six local schools had at least one player selected, with Meigs leading the way with three honorees. Gallia Academy, Southern and Eastern were next with two selections apiece, while River Valley came away with a single representative. 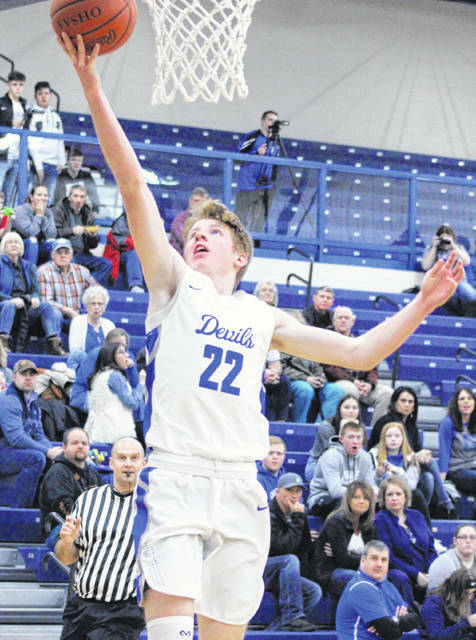 The Blue Devils had a pair of repeat honorees in seniors Cory Call and Justin McClelland, both of whom were special mention choices a year ago. Call was a first team selection in Division I-II and McClelland was also chosen to the second team. The Raiders had one representative in sophomore Jordan Lambert, a second team choice in Division I-II. It was his first District 13 selection. Logan senior Bo Myers was named the Division I-II Player of the Year, while Logan’s Chris Rider won Coach of the Year honors. The Marauders had a trio of selections in Division III as junior Weston Baer was a first team honoree for the second year in a row. Senior Zach Bartrum was a repeat selection and freshman Coulter Cleland was a first time selection, both of whom garnered special mention honors. Mason Darby of Oak Hill was named the Player of the Year in Division III, while the D-3 Coach of the Year was Nathan Speed of Fairland. The Tornadoes came away with two selections, including the area’s lone first team honoree in Division IV. Senior Jensen Anderson was a first team choice for SHS, while senior Weston Thorla was a repeat selection to the D-13 squad after earning special mention honors this winter. Sophomore Garrett Barringer came away with second team honors for the Eagles, while senior teammate Isaiah Fish was also selected as a special mention honoree. Braxton Hardy garnered second team honors for the Rebels while coming away with his second straight selection to the D-13 team. Senior Nick Hicks was also a special mention choice for SGHS. The Division IV Player of the Year was Aaron Music of Coal Grove, while the D-4 Coach of the Year was Kevin Vanderhoof of Coal Grove. Bo Myers, Logan; Cooper Donaldson, Jackson; Seth Dennis, Warren; Logan Maxfield, Athens; Cory Call, Gallia Academy; Gavin Arbaugh, Vinton County. Caleb Bell, Logan; Noah Nichols, Warren; Caleb Wallis, Jackson; Derek Duckworth, Marietta; Jordan Lambert, River Valley; Justin McClelland, Gallia Academy. Austin Witucky and Jackson Graham (Marietta); Coby Bell and Layton Cassady (Logan); Eli Griffith (Vinton County); Isaiah Butcher, Eli Chubb and Elijah Williams (Athens); Clay Miller (Warren). Mason Dabry, Oak Hill; Charlie Large, Ironton; Weston Baer, Meigs, J.K. Kearns, Alexander; Chase Hammond, Oak Hill; Ethan Wilson, Ironton. Matt Mondlak, Fairland; Eli Archer, Chesapeake; Chance Gunther, South Point; Dylan Mecum, Alexander; Ethan Boyher, Nelsonville-York. Clayton Thomas, Ian Chinn and Aiden Porter (Fairland); Jeremiah Stitt and Connor Baker (Belpre); Austin Webb (South Point); Reid Carrico (Ironton); Coulter Cleland and Zach Bartrum (Meigs); Reece Robson (Nelsonville-York). Aaron Music, Coal Grove; Brayden Walker, Trimble; Russell Young, Waterford; Colby Bartley, Miller; Jack Leith, Symmes Valley; Jensen Anderson, Southern. Braxton Hardy, South Gallia; Garrett Barringer, Eastern; Bradley Russell, Federal Hocking; Peyton Stephens, Waterford; Luke Leith, Symmes Valley; Hunter Smith, Federal Hocking. Weston Thorla (Southern); Sawyer Koons, Blake Guffey and Jeremiah Brown (Trimble); Jaylen McKenzie and Cory Borders (Coal Grove); Holden Dailey and Nick Fouss (Waterford); Isaiah Fish (Eastern); Nick Hicks (South Gallia).